Then, look for 1.7.10-Recommended. On that line, find Src. Click Src and it will download the Minecraft Forge Source for our mod, great! 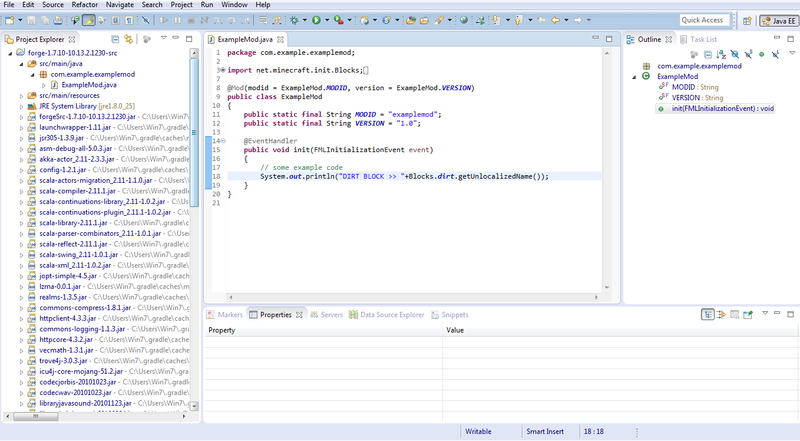 You will see Eclipse IDE for Java EE Developers, click on 32 Bit or 64 Bit. To find out what bit your computer has, go to Start, Right click Computer, and then hit Properties. So you can see under System, mine says 64-bit Operating System. If you have trouble it’s because I’m using Windows 7 instead of Windows 8 Operating System. And I don’t have Mac so sorry Mac Users. So if your PC has a 64-bit Operating System then hit 64 Bit on Eclipse.org/downloads. Then hit [United States] XMission Internet (http). We are not done yet, we now have to setup the Path, this is the hard part in this tutorial. First go to Start, right click Computer, then hit Properties, then on the left side click on Advanced System Settings, under Advanced, click on Environment Variables, now scroll down until you find Path, not PATHEXT. But WAIT, We haven’t found our directory yet, so click on Start, Left click on Computer, then click on OS (C:), now when you downloaded JDK Windows x86 or x64, click on Program Files (x86) or Program Files, scroll down until you find the Java Folder, then go into the JDK folder, not JRE7. Go into bin, now on the top where it has Search Bin, on the left of it click on the directory bar, hit Ctrl + C and it is now on your clipboard. Now, go into the Environment Variables Tab, then hit Path, click Edit…, now on the far right add a ; then hit Ctrl + V and were done with that. Now create a new folder on your desktop and name it whatever you want, drag and drop the Minecraft Forge Src zip folder into there and if you have 7zip or WinRAR, extract the files into there. Now in the folder you just made, hit Shift then right click and hit Open Command Window Here, don’t hit it if you clicked on a folder you just extracted. It will then download everything you need into the folder. Now, your eclipse might have downloaded, so extract the .zip folder into your desktop and create a shortcut on the eclipse.exe file. Open up eclipse and try and find were you put your folder at and click on the drop down arrow on your mod folder, then click on the eclipse folder, and there you go, you have all your mod folders! We have just downloaded eclipse. We setup a Path for Java JDK. We downloaded the Minecraft Forge Src for all our mod files. Check in for next time and we will start coding for our mod! I have everything setup however I don't have the MCP for some reason. When I setup my workspace it only shows the forge libraries and ExampleMod.java. Shouldn't I be able to get also a Minecraft folder where I am able to customize Minecraft? Sorry I am new to Minecraft Modding. I have took the screenshot of my workspace. I always wondered why did I learnt to code. But, I am too busy debugging. I have never seen that before, but I think you alright for coding! As of late 1.6 Forge no longer directly relies on MCP, and as such no longer supports directly editing the Minecraft source code. If you the decomp command you should have gotten a forgeSrc .jar file. If you have, inside that are the classes for vanilla Minecraft, however you cannot edit them, they are read only. I downloaded the eclipse thing but what do i do with it? I am SOOO confused O_o. I think you are running windows 7, but I'm running 8.1. Things are different. When I type that "gradlew setupDecompWorkspace eclipse" into the CMD, NOTHING at ALL happens to my folder, (I think) but I'm not completely sure that it even "registered" on it. And, you just don't explain very well. I might have to fill in some of your holes myself, which might be very hard. Also, where do I find the PART 2 to this? What's it titled? There is no "Continue" button at the bottom of your page. Just a "NOOB TEST" junk ad. I REALLY DO WANT HELP, and I'm hoping that ANYBODY will at least try to answer my question(s). Please and thank you! What's up Zach. I signed up just to try to awnser your question. Try changin the command to "gradlew setupDevWorcspace eclipse". It probably will work. That was my problem too. If it didn't work, check the decompressed archives you got frothe forge.zip you got before. Somewhere there is a "Readme.txt" that should explain how to install it properly. Programming will just get more confusing, so just be patient when searching. If you're tooa mbitious eventually you'll have to "fill the blank spaces" by yourself since there wont be tutorials for that. Hopefully you'll lear enough in the process to help you with that. I'm watching The Mchewy on youtube to start modding. Also, when you advance in your mod, try publishing it on GitHub (also check tutorials to understand it... It's more programing stuff). Community there could be helpful since is a site specialzed on that. Sorry for the bad english btw, I'm not that used to it like before, lol. I hope I could help you. Hey so I'm having this problem where it says "'gradlew' is not reconized as an internal or external command, operable program or batch file." idk what I did wrong .-.